So much has happened since last we spoke! Where do I even begin? Perhaps with last night’s meal at a place called Kura Sushi, which is a conveyor belt sushi restaurant that is literally operated almost entirely by robots which pack the rice, ferry the food to you, and even pour your drinks. Perhaps the New York Times did a better job just a few months ago explaining what makes Kura a neat place than I will. But for those of you who are reading my articles on devices unable to process hyperlinks (like paper), I shall explain! 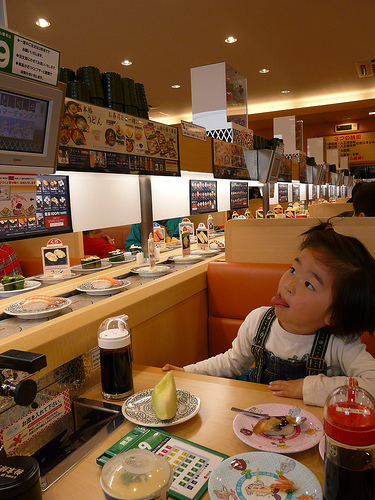 You sit down at a booth with a conveyor belt on one side. It repeatedly shuttles plates of sushi past you, and if you want one, you take it! Every plate is 100 yen. We had stuff like tuna, grilled shrimp with cheese, salmon, salad rolls, eel, shrimp tempura(! ), and there’re even things like potato cheese gratin dishes, ice cream desserts, french fries, hamburger sushis, and onion rings. Kura Sushi is the pinnacle of Japanese achievement. If you needed any further proof, for every fifth empty plate you drop into the hopper, a tiny video animation plays out on your screen, which you will randomly either WIN or LOSE, like a lottery scratch card. If you lose, oh well. But if you win, a large capsule machine mounted atop the conveyor belts screams a ding at you and kicks out a plastic ball with a tiny prize in it (we won two mini-magnet clips last night). Is Kura Sushi the greatest place on earth? Duh. When she is not busy eating at robot-operated sushi restaurants, my companion Jessica Dovey now moonlights as a massive internet celebrity. Jessica Dovey, Jessica Dovey, just to piggyback off the inevitable Google search results for Jessica Dovey. What happened was, she wrote a little line about her feelings on this whole Osama bin Laden thing on her Facebook, then followed it up with a Martin Luther King, Jr. quote. And her friends reposted it, and those friends reposted that, and Penn, of Penn and Teller, reposted that, only somewhere along the way in the Internets the whole thing got made out to be a Martin Luther King, Jr. quote, when only part of it was, and then we got her on Twitter and we had her say “hey, I wrote that,” and there it goes. The true gem in all of this hullabaloo, however, is obviously JessicaDovey.com, which some random purchased bought and registered, and which now displays, in giant, ominous font, the phrase “MARTIN LUTHER KING JR VS OSAMA BIN LADEN VS JESSICA DOVEY.” This elicits the thought of a battle royale grudge match, keep it clean let’s come out boxing, during the course of which these three terrors will fight a battle of spoken ideals, and come out as best pals. We used the “Golden Week” holidays this year, which are a period of a few holidays that happen to fall together next to each other in May, to take a little trip to Tokyo and enjoy city life to the max. Some people dig going to temples and shrines and mountains and castles and seeing “Traditional Japan,” but I’ve already kinda done that. I have seen the best temple and the best shrines and climbed the most famous mountain and been in the greatest castle. So I dig kickin’ through the busy parts of the biggest cities and being surrounded by more people than I’ll ever have occasion to after I leave. The busiest, dorkiest place in the world is probably the section of Tokyo known as Akihabara, where I stopped off briefly when I first came to Japan but returned to this week with two years of haggard grizzle and experience: not fearing the odd constructs of the culture allowed me to really dig in this time. I purchased six Seimitsu arcade buttons from a tiny store on a side alley as narrow as a bathroom stall so that I can modify the new fighting stick I bought recently. We went through anime stores and manga stores and game stores and smoky arcades, drank Dr. Pepper from vending machines, saw maids handing out flyers, and dodged the flannel masses in thick glasses with fanny packs. From other cultures and other countries they are yet my brethren, and as we rifle through shelves of discount, outdated gaming hardware there is an unspoken connection: we were probably both the same, once. The rest of our journey took us to the top of a building in Shibuya where we drank white wine criminally underdressed, to a basement foreigner hangout called the Pink Cow(?) where we dined on enormous burritos and looked at expat creeps, to Shinjuku for fresh hot udon and izakaya beer, tall buildings, the Tokyo Tower, Asakusa and shrines swarming with tourists, and to a variety of places in between. It is a city I could never see entirely even if I had lived there all my life, which resonates with me in an interesting way–how would life be spread out in all directions forever? Ultimately we must choose a place, I suppose. Hundreds of my students are hanging out the windows as swarms of humanity mill about in the school courtyard, chowing down on cheap teenager-made food and listening to music and dances performed earnestly by Other Students. One all-girl band just busted out a not-half-bad rendition of “I Love You Baby” to the cheers of the student body and their parents and community members, which took place after the dance club, clad in not-just-a-little-suggestive black skirts and purple backless lace-up tops, performed a significantly inappropriate series of gyrations to a Lady Gaga song. This Is FES, the banners say, where FES means festival, most specifically the school’s yearly bunkasai, a festival of culture. This means performances for two days by every club and group we have here. The brass band busted out forty-five minutes of tunes, some conducted by club members, culminating in an enjoyable Disney medley, while the drama club today put on a full production of “DEATHNOTE,” which is a popular anime-manga-movie franchise here that I have never seen. The choir performed to a house so packed that the old ladies had to fan themselves with their programs. What this all means for me is that for two weekend days, Saturday and Sunday, I am here at school, at work, during a time traditionally reserved for Not Work. In addition it means I am accosted by students begging me to buy their wares, foods, snacks, pose for cell-phone pictures, and visit the rooms where their club activities are on display. Actually, despite the whole shebang requiring me to wake up at 7 am both days of my weekend and proceed to work as though it’s just another weekday, it’s actually pretty entertaining, and definitely a uniquely Japanese school-spectacle, since these kids have stuff to show off that are the fruits of actual (significant) over-practice, unlike the half-assery often on display back in the US of A. As compensation I get Monday off, and another Monday next month. That’s fine I guess! As the resident foreigner the day off cannot come too soon–it is easy to understate how exhausting it can become merely being Looked At by every kid you have ever taught, their friends, siblings, parents, grandparents, community members, and their pets. Suffice it to say that after today I will be ready to get all the eyes off me by heading home and setting my hands to work cooking up some steak burritos with the meat I’ve had marinating all day, and sinking these teeth into it, and chilling down with a couple beers while absolutely nobody watches me. Perhaps this is the counterpart to celebrity: it can get a little tiring knowing how many people are always preoccupied with you instead of themselves. Maybe I’ll ask Jessica Dovey how it feels.